Navigate by clicking on doors or door numbers. …a melancholy little courtyard surrounded by a brick wall too high to see over. A dead tree lifted its bone-white branches to a sky filling with gray clouds. “Those doors look very strange,” they said. “You should say, ‘They look very strangely,’” I corrected. A sudden gust of wind made the branches clatter against each other like old boards. Dead leaves began to gather at our feet. Ah. “bare witness” should be “bear witness” in my long post above. You remind me of another guy who used to post around here a lot but you’re more lucid and much better looking. I’m glad you think my comments are lucid. My looks must have something to do with my Mediterranean heritage. Pair of “bleached bones” leading to 44 is another “B+B, B+B = 4,4 = 44 solution. First, we need to consider a number of different door solutions. 1)	The Bs in the 2 “bushel baskets” are alphanumeric 2s. B+B, B+B = 44. 2)	There is a bone by the two baskets, and a broom. We have 4 Bs, and again B+B, B+B = 44. 3)	The bricks between the doors are four across and we can see two sections of them – one between 44 and 19 and the other between 21 and the unnumbered door. 4,4 = 44. The fact that “brick” is another “B” word is also relevant. “Brick” also appears in the text to help us notice this. 4)	There are an abnormally high number of consecutive 4 letter words in the text – “dead tree”, “with grey”, “look very”, “they said”, “they look”, “look very”, “they seem”, “wind made” and “push open”. If we add “bone tree” and “claw rake” from the picture then we have 11 sets of doubled 4 letter words. 11 x 4 = 44. 5)	There are also a large number of double letter words in the text – “little”, “surrounded”, “wall”, “too”, “see”, “tree”, “filling”, “doors”, “look”, “look”, “corrected”, “seem”, “sudden”, “clatter”, “feet”, and “doors”. There are 16 of these. Then we can add “broom” and “tree” from the picture to get 18 total. Then there are also exactly four 4-letter words that appear twice in the text – “very”, “look”, “dead” and “wind”. This gives us 22 doubles and 22 x 2 = 44. 6)	The 4 repeated 4-letter words by themselves also can be taken to give us a 44. Let’s stop at that point and put all these ideas together. A 4-letter word that begins with “B” and has a double letter – “bull”? Did he leave us any clue that “L” is the double letter? I believe so – the only letter that starts one of the doubled words and that is also a doubled letter is “L”. And then what about a clue for the vowel? If we take the alphanumeric value of the vowels there is no door for 1,5,9, or 15 but there is an open door to 21 and 21=U. So, we have the word “bull”. Next, we need one more door solution: The rake points up at the hand-like branch. Together these two objects give us “claw”. The “baskets” and “bone” can give us a “body”. Now look at the broom, it crosses the tree and is visible through that hole. The tree has been “pierced” it seems, and maybe through the eye socket. It seems this tree has been a victim of violent attack by something with claws, maybe in fact “rending it with claws”. The key then is to see the tree and having a figure 8 in it, and if we rend that apart into two pieces we have two 4s, and we can get our 44. The 8 is reinforced by a prominent foreground branch with 8 “fingers”. We can also string together some connections to “do not bare false witness” – the eight commandment. The eyes seem to witness us here and the text has “look” twice and “see”, we have a COURTyard, and the “Dead leaves began to gather at our feet” in the text connects to the skeletal foot of the bear in 42, as do the rending claws. And room 23 which features the 8th commandment has links to the bear in 42 as well. 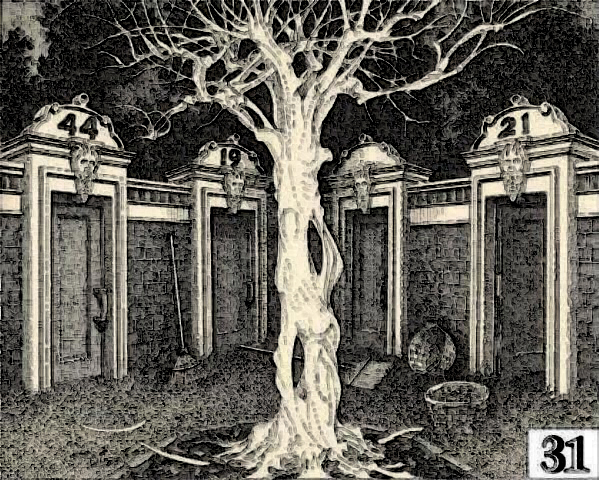 The idea that each half of the tree can be a 4 is reinforced by the “eyeholes” in the tree matching up with the closed 4s above door 44. If we add this “rending” door solution to our bull, we have a half-bull. As for the half man part? It may be as simple as noting that the tree appears half-tree half-human. But also the text has “managed” which is “man” followed by 4 letters. Finally, once we are looking for the minotaur here there are a number of subtle connections. The word “melancholy” is found in the text and it is a word that has been used to describe the minotaur. The text also has the word “courtyard” and this appears a couple of times in the very short Burges tale “The House of Asteron”. Some of the watching eyes may be blind and the minotaur is blind in Picasso’s painting which is also referenced in room 7. The whiteness of the branches, perhaps, might connect to the whiteness of the Cretan bull. The text contains the word “over” and “lifted” which might direct us to the top of the page. There 43 branches (plus or minus) hit the top of the page and room 43 is where we find the hidden face of the bull in Satan’s face. The word “heavy” appears in Maze only here and in room 32 where we might think of Hercules (whose name does appear in Maze on the wall in 15) in connection with the missing statue and the large stones. If this helps us think of Hercules here in 31 then we can make a connection to one of his labors and the Cretan bull. Then of course, Theseus found the minotaur with a pile of bones from his victims – so that is minotaur related as well. Oh – and then to know he is the guide I suppose note that the tree’s “hand” reaches for the correct door – 44. The room and the tree can also remind us of Dante’s forest of suicides where those that took their own life are twisted trees that scream when injured. The faces on the wall in that context could represent the harpies that torment them. The connection we should make from this is that King Minos (of Minotaur fame) was in charge of the punishment of these victims in Dante’s inferno. It’s possible 44 is the right choice because it’s the highest number and only degree in the room above freezing (I am assuming Manson used F not C. It wouldn’t matter in any case.). This is also reinforced by the degree signs above the doors. It is noted in the text that the visitors are cold, and the warmest location would make sense. Given that there are only 45 rooms the fact that the correct door number in this room is 44 gives this solution some extra credence. The capitals certainly could be degree symbols and the mention of cold works. There could be something to this. Is the message in this room that it leads to a DEAD END, also known as a BLIND ALLEY? BLIND ALLEY: The room is concerned with eyes and seeing, but most of the eyes look blind (no pupils). In the text: “…surrounded by a brick wall too high to see over.” One of the sideways eyes in the tree (which are really just holes and must therefore be blind) is bisected by a broom which points to 19, the final stop before you have to turn around or end up in the Trap. You could take the three white fallen branches and make them into a four. The branches are likened to boards, suggesting you build something out of them. Also the mention of dead leaves gathering “at our feet” suggests looking down for an answer. Another thought: the negative space in the branches on the left form eyes, a nose, a mouth, and a triangle shape like the beards or whatever those triangular things are on the faces over the doors. The branches echo the weird fire-like hair on the faces. It seems to be looking at 44… it also seems to belong to the arm that Beelz already has on the board. The one really curvy “finger” of the ghostly hand forms a pretty good capital D = 4. So many letters in those branches. A really good A and E… hm. 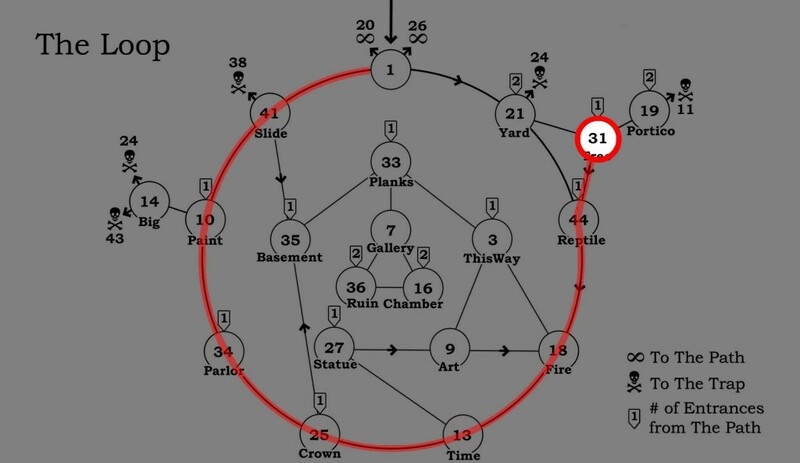 The tree has two holes in its trunk, matching the two “holes” in 44 as written (with closed tops as opposed to with open tops; 4s appear both ways in Maze but open tops are more common). The number 19 has only one hole and 21 has none. Perhaps the hole/circle design on top of the doorways reinforces this. Congratulations Aria and (from last year) Hidden Mystery! Regarding the “incomplete” four sets of eyes solution above, could it be as simple as 4 eyes on each side of the tree? 4/4 = 44. Hmm, I hadn’t thought of that, but I suspect it is intentional. Adding to the summary. Nicely done! I really think this is the most haunting and unsettling rooms in the book. The whole bit about the animal attacking the tree, the creepy heads with moving eyes, the darkness all around and the skeletal malevolent tree all add up to make the reader make a quick decision to get out of here at once… hopefully the wrong way. What is the bit about the animal attacking the tree? You have to read between the lines. The tree is gouged and scratched like some animal attacked it. Pretty unconvincing, though, this idea of taking repeated objects to suggest repeated digits, if for no other reason than because the objects aren’t made to look identical. If that’s the point, why make the two rakes different, you know? And the symmetry, man, that’s pretty loose. Notify me when new comments are added to this page. Images and text from "MAZE: Solve The World's Most Challenging Puzzle" by Christopher Manson used with permission.